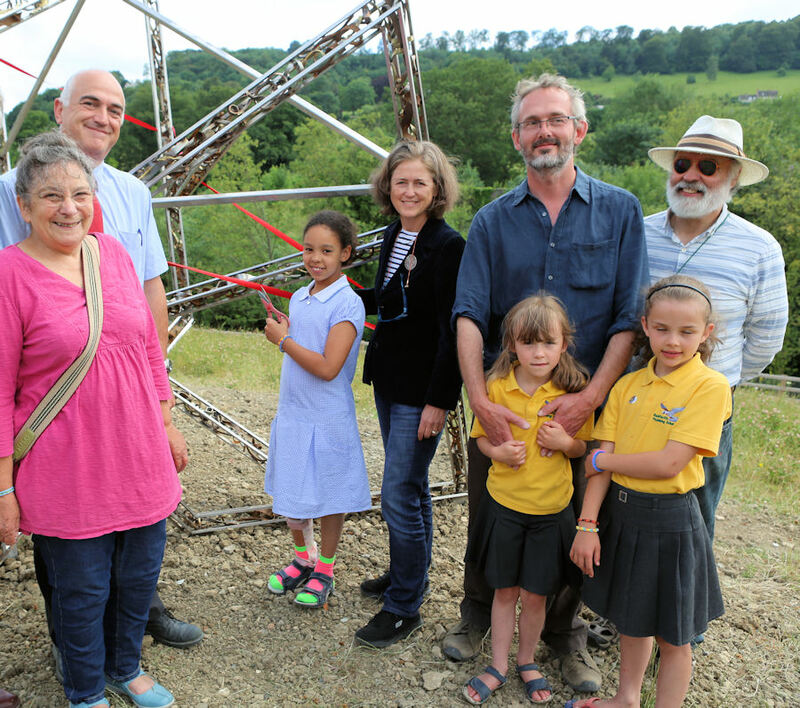 The recycled metal sculpture created by Stroud college lecturer Sam Freeman was 'unveiled' at Stroud's new waterside park at Capels Mill on Friday 4th July. Sam was succesful in the recent 'Search for a Sculptor' competition sponsored by Pangolin Foundry of Chalford. Pangolin Foundry Directors Claude Koenig and Rungwe Kingdon responded positively to an approach from James Pentney and Sandra Hickmore. 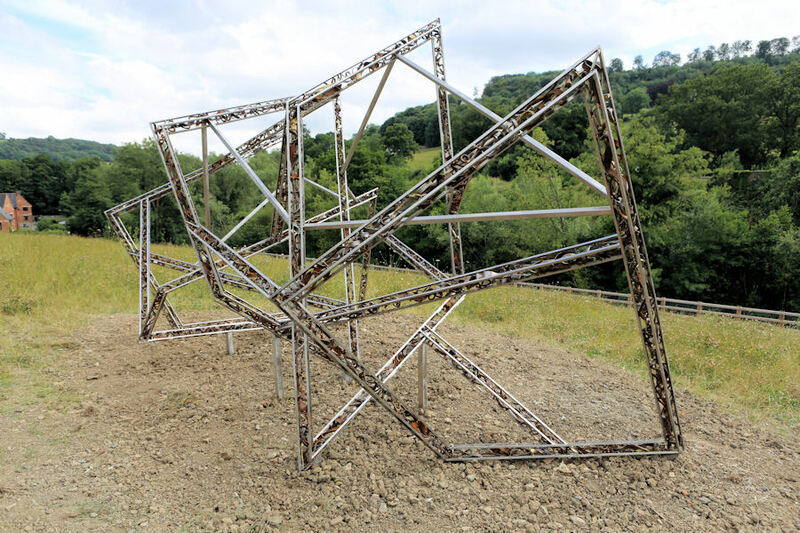 James & Sandra formed the original concept of a competition to identify a Gloucestershire based artist to create a piece of public sculpture that captured the essence of Capels Mill. Sam was given access to recyclable material produced by Pangolin's foundry. Pangolin also provided workshop space, equipment and technical advice from one of their staff. Pangolin's generosity did not end there… Sam Freeman also received a £2,500 cash award. 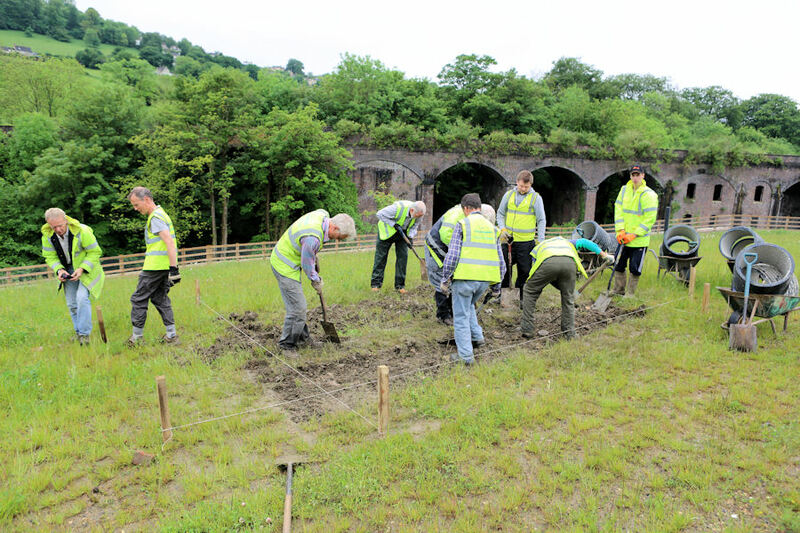 As the sculpture neared completion, albeit a little after the intial time target, Stroud District Council's team of volunteers, led by Volunteers Coordinator Paul Weller, prepared the site and ground fixings. Pictured right from left to right are Sandra Hickmore, David Marshall, Seryn who cut the red ribbon, Claude Koenig, Sam Freeman, James Pentney and Sam's daughters Ellen and Esther. Guests at the installation celebration event enjoyed strawberries & cream generously supplied by Waitrose. The immediate area will eventually be seeded using the wildflower mixture that is developing well on what was once Stroud's domestic rubbish tip. Volunteers from Stroud Valleys Project (SVP) led by Fred Miller are nearing the end of the Capels Mill tree planting scheme. Part of the SVP scheme is to install three timber picnic table & bench sets and a further two bench seats in the immediate area. The result will be a waterside area where people may wander and ponder whilst taking in the spectacular views across to Rodborough.
" Does your piece have a title?" Sam replied "Yes. It is inspired by being in Capel’s Mill and looking at the interplay between various lines of travel: canal, river, railway, road and footpath. So, its title is… In Transit"
Pop along and see what the piece says to you!